Looking at the word ’emotional intelligence’ itself indicates ones ability to understand or interpret emotions of themselves and the others. What does that mean? The person is able to monitor and discriminate different emotions, label them appropriately and use that information to guide their thinking and their behaviour. Hence it is considered crucial in a workplace as it is applicable to all interactions in a business environment, as it establishes proper relationships between managers and staff, directors and managers, customers and organizations, suppliers/vendors and company staff. It is said that companies which are emotional intelligent have staff who are motivated, efficient, committed, productive, rewarded, and confident. There are various factors or effects of emotional intelligence for different categories of people. Managing a group of people or team of multi-faceted sections is not an easy job. There is something beyond showing guts and will power and that is your emotional intelligence. It is not unprofessional to show this quality. As manager you would need to increase performance through the governance of behavior of people working under you. There are certain traits that you need to check to see whether you know how to govern them. Understand what are your strengths and weaknesses. This can be analyzed through feedback from mentors or your colleagues. Getting to understand what do they intend to say should be the right approach. Making changes to your behavior would surely bring a great impact. Pointing fingers at your team is not going to solve the issue. You must know what the factors behind the issue was and walk the talk with them. This would ease the severity of the issue and bring out more facts. By getting to use a softer tone you could get to the core of the problem. Even they would be ready to provide solution. Sometimes, working in the position as manager you would probably not be realising that you have some missing qualities. Having a mentor like your spouse or your friend or your elder relative could help to know what the missing factors to improve on yourself are. Sharing those details with them regularly will allow to open yourself so that you get right criticism. Being open to feedbacks is very important for you to know what you lag. Not all days are you going to have positivity around you. When the negative emotions flow in, stop yourself and ask why. There should be a reason for it. If you cannot get to understand, get help from your mentor. They would use their perspective and explain for you to make the change. You would have realised sometimes that you would explain something again and again but your team doesn’t understand what you want to say. Instead of going about the same way, explain it differently. The result you are expecting is the same but the method is different. It is best to observe your team mind-set and behaviour. By observing their behaviour you could approach them accordingly to execute the task efficiently. Each team member has different emotional patterns and by understanding their nature you would need to exercise caution while talking with them. When expecting results from your team, try to be practical in approach. If you give an assignment, do not expect a 100% result the next day itself. There are number of factors and circumstances or situations that each member would be faced with. Put yourself in their shoes and then give out tasks that can be executed. Though you would not feel what they are experiencing, there could have been other instances when you too would have faced that situation. Hence, being empathetic as much as possible is crucial to get the confidence and trust. If you desire to achieve good results, then encouraging two way communication is mandatory. You need to show that you are interested in them by listening to them, showing curiosity in what they have suggested, asking for their feedback, letting them be part of decision making. This way there is no withholding of information. The most important part of all communications is to acknowledge the efforts of your team. Take time to thank your team for their hard work and indicate to them that success was achieved because of them. Celebrate the success with them through rewards. You would get more support from them for future assignments. Students whether in school or college environment undergo a lot of emotional state of mind during their sessions in the classrooms. There are mixture of feelings that guide them throughout the day. Studies show that the student has to practice the skills of how the emotional input connects with empathy and understanding, receipt of feedback and evaluating judgement of others. The emotional brain connects with the rational brain. Students who are the future bricks of society building block need to have developed the emotional intelligence skills along with the other skills. These skills are not visualised in the resume or other documents. It can be only seen once they start interacting with other members. To do this, the teacher or tutor has to instigate the students to express their feelings. By doing so the student would know what sort of feeling he/she is undergoing. It could be fear, anxiety, anger, happiness, bitterness, etc. The negative thoughts would be brought out so that they are taught how to interrupt them. Besides, the relationship between thought, feeling and action is better explained. It helps to make the student realize what the outcome of their thoughts or feelings is. The student is made to realise the limitations they should exercise. If the student feels bad about a failure, then she/he is taught how to soothe or pacify themselves. By setting up goals it would be easier for the student to know how they can achieve their objectives. This would show them that they have the power to change the destiny. Developing attitude of positive thinking is one important factor. The basic need for student is to be able to communicate. They must be taught how to understand, what the effects of their body language are. Also they must be taught when to use “I” and when to use “we”. The teachers must be quick to note the blockers in student communication. Their speaking skills can be enhanced by assigning class room seminars, speeches, skits, dramas, etc. The students should be made to work in groups to enhance the interaction within group. It will bring out the leadership qualities as well as follower skills. Besides working in groups the student would share information and value each others contribution. The opinions within the group triggers emotional factors that are controlled. When working in group each student recognize the commitment they have towards the task. They also learn to tolerate within the group. Every classroom or each student is faced with conflicts during their study phase. When confronting them, the students would have to resolve their differences. This makes them know how to resolve issues by identifying the needs and wants. A successful teacher need to handle their negative and positive emotions in a proper healthy way. Then only can they develop good atmosphere in a classroom. To know what the ways to manage them are, let’s have glimpse of some of them. As you are in front of classroom every day, you need to keep check on your emotions. If you feel a sign of disrespect or things out of control or not obeying, then don’t blame the children. You are responsible for those. Ask yourself what feeling you are going through. You know respect must be earned. So if you show them, you will receive them. Besides, child’s emotional needs are what you as teacher need to take care of. So use patience in knowing that. Make yourself feel good about yourself. When you feel good, you are more patient, understanding, accepting, and tolerant. The implication is that student also would feel the same way. When you talk with students asking about how they feel and what they would feel after action, you would be bringing closer interaction and thereby respect. They feel that their feelings are respected. Accept and validate their feelings with empathy whenever needed to. Show concern in your voice. Don’t come to conclusion after an incident and indicate the tone of implying ‘should’. After all every student has their way to showcase their work. They would perform better at later session. Make the student realise how their decision could have its effects. You could teach them how to solve their problems using compassion, empathy and how to respect each other’s feelings while taking them. Allowing them to make choices will bring in many advantages. By forcing those to participate in any activity would only hurt them. Participation should be considered voluntary. It shows you, respect their interests as well. It is always better to express your feelings as teacher to students rather that commanding. By doing so, students would feel that they are not humiliated or embarrassed or punished. There is freedom from fear factor that causes emotional pain. Creating stimulating environment for pursuing their course of study is essential. By speaking to them kindly and with respect would bring good results. Treat the students as individual entity. Each of them have their unique talents and recognise them for it. Bringing out those talents helps the students to build self-confidence. They become self-aware and self-empowered. Having a flexible mind would make the students accommodative. There are always instances where the rules can be bend. Being flexible with students whenever needed has great impact on the relationship. Emotional Intelligence is a factor that determines one’s ability to understand the others emotional language. In other words, it is ones professional and personal perception and interactions. Managers have to handle day to day stress. 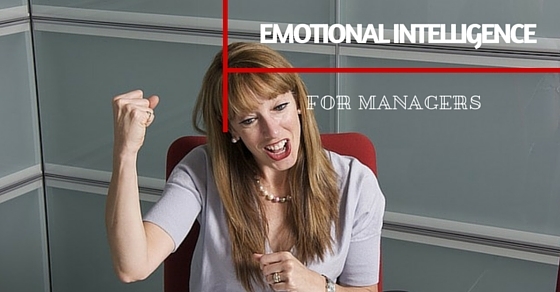 With high emotional intelligence a manager is said to handle emotions with ease. It can be seen in the form of reduced accident rates, reduced grievances leading to higher revenues. Staff with better emotional intelligence are valued as they tend to remain calm during stressed situation or unforeseen event. They know how to manage the situation. Also they can resolve conflicts and are empathetic to their colleagues. They are people who lead by examples. Generally personnel with better emotional intelligence are preferred over the others as they drive the company’s profits. A specific image is created about them. Personnel with emotional intelligence is said to have better qualities when compared to others. For instance, they admit and learn from their mistakes, take criticism, cool under stressed situation, able to control emotions and conduct thoughtful decisions, not selfish, not rigid, caring for their team. People working under you are happy means that you are taking care of their emotional and financial needs. This could help you land with a promotion as the team is more productive under your guidance.